E3 is a wrap, we’re done. We’ve had our tease into upcoming strategy’s, hardware refreshes and games releasing this year and further. Some announcements and reveals grabbed the headlines more than others and took the attention and front pages of gaming websites. Microsoft revealing their new hardware for 2016 and confirming the future of Xbox with Scorpio. Nintendo wowing us with what will undoubtedly be game of the year when it releases with Legend of Zelda: Breath of the Wild. Sony had their fair share of media grabbing attention with a release date for Last Guardian and the reveal of new games like Days Gone and Resident Evil 7 reveal. But what may have gone a little unnoticed is how Sony and PlayStation have quietly and to little fan fair acquired a new mascot. While at their conference we were reacquainted to an iconic PlayStation mascot in Kratos from God of War fame, and the return of Crash Bandicoot a PlayStation icon from yesteryear, we also got a first look at the heavily rumoured and finally confirmed Spider-Man game exclusively for PlayStation 4 from Insomniac. This generation has seen console exclusive games as a norm really so it’s understandable that while impressive having a Spider-Man game exclusive for a console it goes a little bit unnoticed. 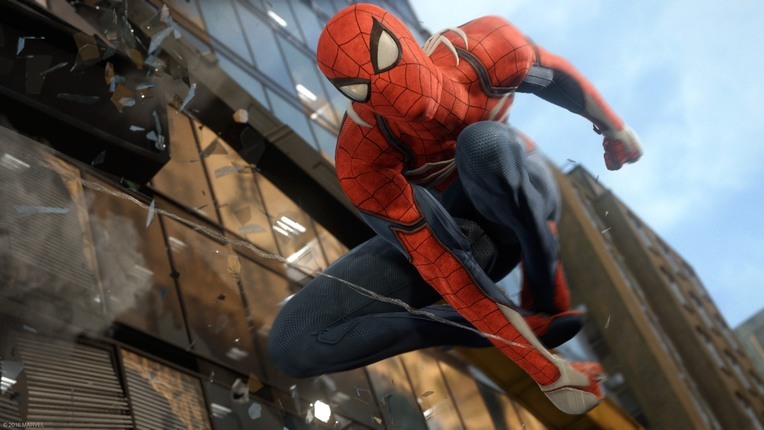 But it wasn’t until we got more details on Spider-Man PS4 from Vice President of Marvel Games from Marvel Entertainment Jay Ong via interviews with Venturebeat and Gamesindustry.biz. It certainly reads as if Sony have got their hands on a new exclusive franchise going forwards based on that part of the interview. As the whirlwind of news and releases die down now E3 has passed I feel that it’s understated at just how massive of a pickup this is for Sony. Polls on popular comic-book websites run in 2014 and 2015 reveal Spider-Man as the most popular marvel superhero. And this is during the height of Avengers movies and with the less than favoured amazing Spider-Man films featuring Andrew Garfield which did not meet the weighty expectations of the Spider-Man series on the big screen. With the deal agreed between Marvel Studios and Sony Pictures for Spider-Man to appear in Captain America civil war, and the future Spider-Man films now in the hands of Marvel studios, Spider-Man’s big screen appearances appear to be in safe hands, and the timing couldn’t be more perfect for Sony and PlayStation. Jay Ong also stated there will be no more Marvel movie tie ins and future games will be given big budgets and given to high quality developers. Going away from movie games was a big pivot. Those just didn’t work for us in the past. The idea of creating original storylines, giving the developers the freedom to create something new—from a creative standpoint that’s liberating for our partners. And for us it results in great games. More news to PlayStation fans ears as it all but confirms any future PS4 exclusive game is set to be of a AAA standard and not follow any film plots. Although judging from Tom Hollands Spider-Man performance in civil war we should be free from a stinker of a performance on the big screen in future films as he quite rightly stole the show in his limited scenes in civil war. Sony have a strong collection of recognized characters and faces with Nathan Drake, Kratos, Ratchet and Clank, Helghast soldiers and soon to be Crash Bandicoot again, but you’d bet that more people would be able to name Spider-Man than any of those others. To summarize it up nice and clear, in the medium term Spider-Man is effectively a PlayStation exclusive franchise. It’s certainly quite a coup for Sony.